The mixed feelings I have on this book do not necessarily carry negative connotations; however, I will admit I have a love/hate relationship with it, which I’ll explain further. 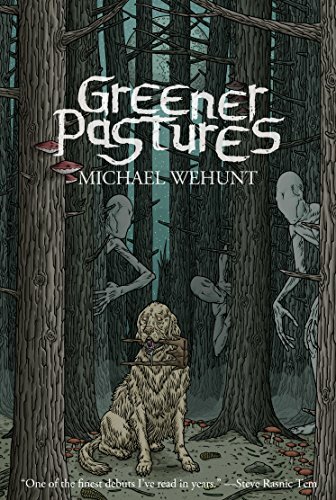 Really, if there were a negative thing to say about Greener Pastures it would be that it’s not the type of book you grab when you’re tired or feeling “brain lazy”…that is, it’s not a dumb read–or an easy read I should say. An easy read being Dean Koontz or James Patterson. This isn’t anything like that. Wehunt’s prose is polished and beautifully poetic, but quite honestly I was going to give it four stars only because when I read short stories (with the exception of Poe and Lovecraft) I kind of like to shut my brain down for a bit; however, a four-star review would be robbing all the hard work that Wehunt has clearly put into each piece in this collection. The beginning of each story particularly was often like holding on too tight when all I wanted to do was let go, but after a page or two I could relax and absorb each sentence comfortably without fear of getting lost. But that’s just me, and I understand that not everyone reads like I do and so the fifth star was added, and deservedly so. The bottom line is this: Michael Wehunt is an excellent writer and should absolutely be recognized and his stories celebrated. This collection is up there with one of the most unique I’ve ever read. The stories are fresh and with some of the tightest prose I’ve seen, and the ideas he presents are disturbingly original, often filled with hopeless grief. If you’re only used to the likes of King and Koontz for your reads (no offense guys..I love you too) then this may be a small struggle for you, but it will certainly open your mind to a whole new world.